As blockchain technology proceeds with its winning march across world industries, hospitality seems to be the next stop. In this article, we will review the current problems within this market, possible solutions from an industry expert, and some specific cases our team has encountered. Welcome to the future of hospitality and travel. Assuming that today’s technological possibilities resolve the issue with search is rather naive. With dozens of aggregators and hundreds of providers being just one click away, consumers are left in front of endless options which lead nowhere and suspend their decision making. As a result, even the process of choosing a relaxing activity turns into a real burden, often emotional and fraught with financial potholes. As if that were not enough, booking is even trickier. What should assist customers with convenient reservations—online aggregators and tourism agencies—has become a point of frustration for reasons such as misinformation, hidden fees, and vague lists of repetitive options. Intermediaries sometimes even falsely confirm bookings, which becomes a big issue when a traveler arrives at an overbooked hotel! What is more, there are issues with privacy and secure transactions. Not surprisingly, people are more eager to go on vacation to places their friends recommend or to stay at the hotels predetermined by their employer during business trips. Reputation and loyalty points seemed to have solved the problems mentioned above. Yet, the the 2015 Colloquy Loyalty Census showcased that the average U.S. household participates in 29 different loyalty programs, again an overwhelming amount number to choose between. Moreover, in the last two decades, the international hotel industry has been suffering from market segmentation and overlapping of brands. 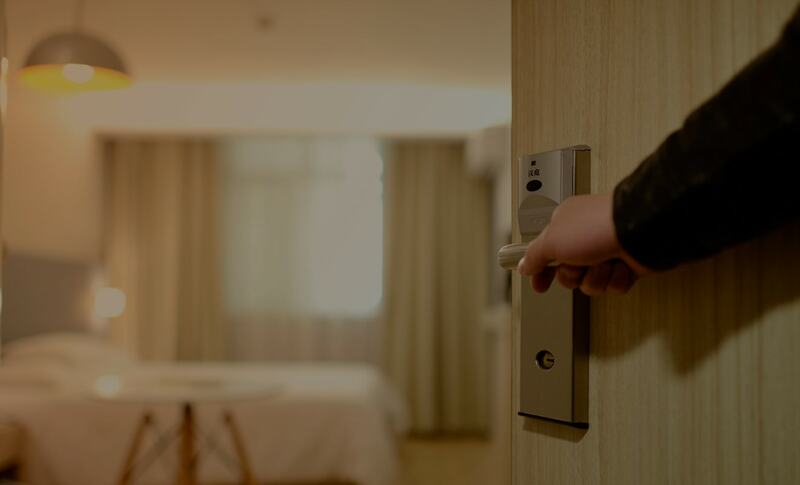 Lodging chains started focusing on a specific niche of travelers, creating additional challenges of matching a target audience and convincing it to select a particular brand. Beyond that, investors who bought a stake in a certain franchise are worried that the same franchisor might compete with itself by increasing the number of brands. The participants of the Schoffstall survey admitted that managers assigned an unbearable amount of tasks that they had to complete at once. When problems appears with human capital, no technology can aid. Nevertheless, there are some hints that distributed ledger systems could help to organize the workflow better. When Airbnb came to market, hotels took the threat seriously. In addition to already tight competition in the hospitality market, they had to become even more innovative to combine high-level service, trust, and the particular tastes of diverse audiences. This also means addressing specifically and carefully each of the issues mentioned above. Sekhar Mallipeddi, a consulting director of transportation and logistics at PwC, pointed out that the hospitality industry lacks a centralized settlement process between companies within the industry. This leads to proven cases for utilizing blockchain technology. 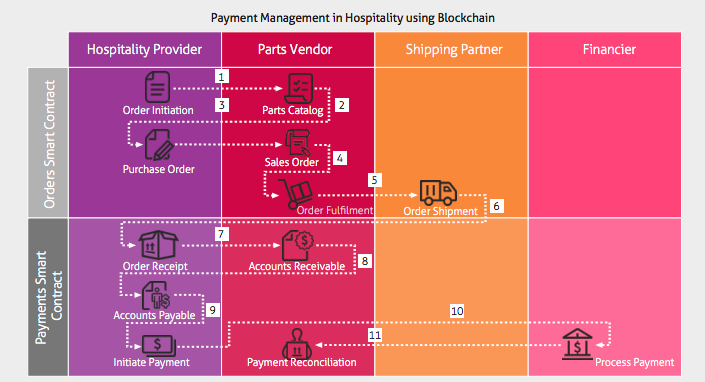 Therefore, hospitality providers that strive to enable additional services for premium guests seamlessly and automatically, are going to need the help of blockchain. For instance, such services as Travala (formerly Concierge) propose a redefined booking model for the hospitality industry aiming for efficiency, zero misplaced or overbooked options, and little to no commission. A hotel network can now store all their loyalty programs on the same blockchain thanks to a service called Credits. Furthermore, emerging customer expectations can be met now due to the exchange of these points across various services and industries. 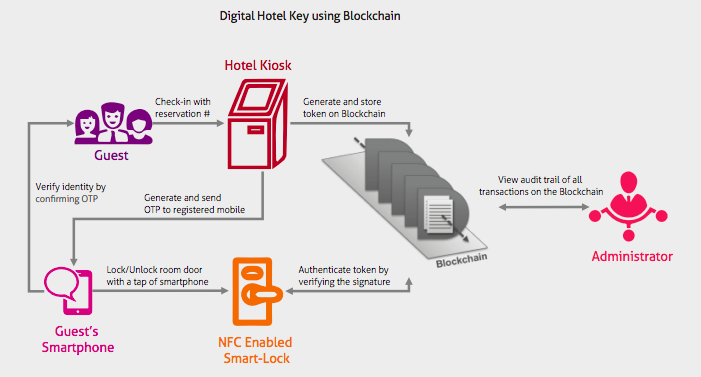 While adoption of the technology has not yet reached the plateau of productivity, Germany’s TUI Group is currently testing blockchain within its tour operator business to roll out its “bed swap application.” Ultimately, hotels become smart environments. The day when a hotel will be able to generate smart IDs to personalize their offer or simplify check-in is near. With its help, the management will know if the guest is eligible for a senior program, auto club, reward program, Affinity Group, and targeted promotional rate without asking the guest to remember a special rate plan, or showing corporate ID or coupon code. Notably, the horizontal distribution of supply chains and interconnectivity of global networks continue to increase. Mallipeddi emphasized that blockchain could be equally used for intercompany settlements, for example, arrangements between a hotel and an airline company when the latter purchases blocks of hotel rooms. In 2015, a payment network called Universal Air Travel Plan (UATP), owned by major international airlines such as American Airways, British Airways, and Lufthansa, partnered with bitcoin payment processor Bitnet. It was one of the early steps to increase the interoperability and efficiency of the traveling and hospitality industries, including 260+ airlines in the network. AXA, a French insurance company added one more industry to the mix of travel and hospitality to automate compensation to passengers whose flights are delayed leveraging smart contracts. Therefore, if a delay of over two hours is appended to the ledger, compensation is automatically transferred to the customer eliminating the need to file a claim or dispute any discrepancies with the insurer. 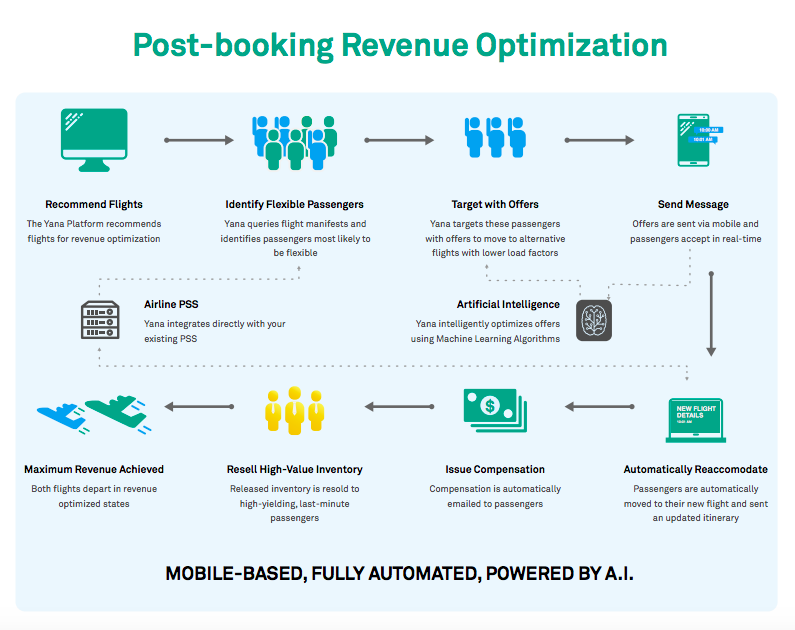 To combat overbooking both for hotels and air travel, a combination of machine learning and blockchain promises a powerful alliance. 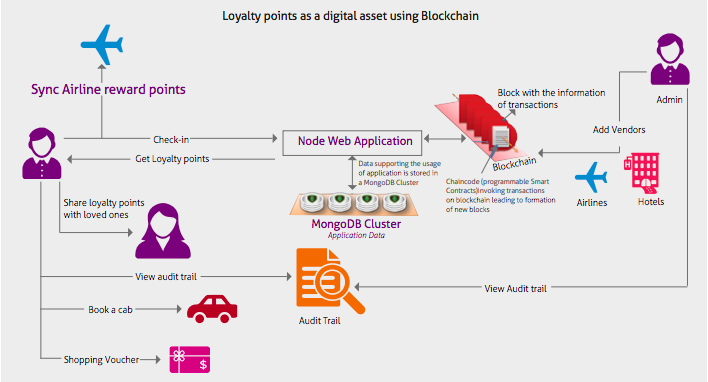 While the former can effectively filter out flexible passengers or guests and target them with new options, the latter technology fixates an updated information across the distributed ledgers of partners to avoid miscalculations in future. 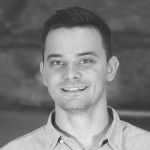 One example is Atlanta-based airline software company Volantio. Finally, blockchain is about cutting costs and maximizing profits within already huge enterprises. Services like Volantio could automate compensation to passengers and their reassignment to new flights while also selling open seats to “high-yielding,” last minute passengers. As a proof of concept, the company has already partnered with Emirates, Ethiopia Airlines, Alaska Airlines, and Jetstar, and might demonstrate being indispensable in eradicating last-minute negotiations at the gate. This, in turn, will help to avoid flight delays which are costly to airlines. It is crucial to recognize the early stage of all the pilots going on right now. Even when a certain technology proves to be error-free and 100%-secure, it will take years to implement it at a large scale and drive mass-adoption. Nevertheless, global brands understand well the importance of new opportunities that present a competitive edge to them. Moreover, with government backing and dozens of industries exploring blockchain technology, it is only a question of “when”, not “if”. Did you like the review? Read about the current state of Advertising and Healthcare. Schoffstall, Donald G., “The benefits and challenges hospitality management students experience by working in conjunction with completing their studies” (2013).